Can the Zika Virus Help Fight Aggressive Brain Cancer? The Zika virus, the subject of a global health scare over the past couple of years, might actually help fight an aggressive form of brain cancer, researchers at the UC San Diego School of Medicine announced Tuesday. In an article in The Journal of Experimental Medicine, the UCSD scientists and colleagues at Washington University of St. Louis said Zika might improve survival rates for patients diagnosed with glioblastomas, the most common form of brain cancer, with a median survival rate of just over 14 months after diagnosis. Standard treatment involves surgery, followed by chemotherapy and radiation. Yet most tumors recur within six months, fueled by a small population of glioblastoma stem cells that resist and survive treatment, continuing to divide and produce new tumor cells to replace those killed by cancer drugs, the scientists said. Dr. Zhe Zhu, a postdoctoral scholar in Rich’s lab and first author of the study, noted the connection between the hyper-reproductive capabilities of glioblastoma stem cells and neuroprogenitor cells, which fuel the explosive growth of developing brains. Zika specifically targets and kills neuroprogenitor cells — leading the scientists to study the virus’ impact on the cancer stem cells. They infected cultured tumors with one of two strains of the virus. Both strains spread through the tumors, infecting and killing stem cells while largely avoiding other tumor cells. The authors said the findings suggest that chemotherapy-radiation treatment and a Zika infection appear to produce complementary results. Standard treatment kills most tumor cells but typically leaves stem cells intact, while Zika attacks stem cells but bypasses ordinary tumor cells. 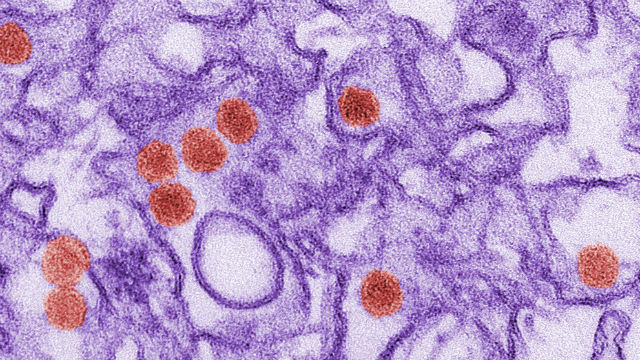 “We see Zika one day being used in combination with current therapies to eradicate the whole tumor,” said Dr. Milan Chheda, an assistant professor of medicine and of neurology at Washington University School of Medicine. A spate of children born in Brazil with microcephaly, a condition in which babies with mothers sickened by the Zika virus have smaller, misshapen heads and a shorter life expectancy, began drawing international headlines early last year. In San Diego County, 95 cases of Zika have been confirmed since the beginning of 2015, including two in which babies were born with microcephaly, according to the county Health and Human Services Agency. None of the cases have resulted from a local mosquito bite. The scientists have also tested Zika in mice, injecting the virus into glioblastoma tumors. Two weeks later, the tumors were significantly smaller, and the mice survived longer than those given a placebo. The scientists said they were aware that the idea of injecting a virus notorious for causing brain damage into patient’s brains seems alarming, but they said Zika may prove a safe therapy with further testing because neuroprogenitor cells are rare in adult brains. The opposite is true of fetal brains, which is part of the reason why a Zika infection before birth produces widespread and severe damage while a Zika infection in adults typically causes mild symptoms or none at all. The researchers also conducted studies of the virus using brain tissue from epilepsy patients that showed the virus does not infect non-cancerous brain cells. They also introduced mutations to the virus in an effort to make it a safer treatment option. Glioblastoma is the type of brain cancer afflicting Sen. John McCain, R- Arizona, who announced his diagnosis in July. More than 12,000 Americans will be stricken with the condition this year. Researchers with the Cleveland Clinic and University of Texas assisted with the study, which was funded by the National Institutes of Health, the Pardee Foundation of Midland, Michigan, the Concern Foundation of Los Angeles, the Cancer Research Foundation of Henderson, Nevada, and the McDonnell Center for Cellular and Molecular Neurobiology at Washington University.